Currently all Tri-Ex and Tashjian galvanized arms are hoop style. Curved arms can be ordered powdercoated. All arms attach with U-bolts. Currently all Hy-Gain galvanized arms are hoop style. Curved arms can be ordered powdercoated. All arms attach with U-bolts. 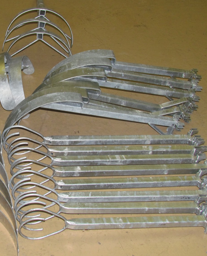 Currently stocking galvanized arms in both hoop style and curved style. Top arms attach with U-bolts, lower arms use straight bolts through factory bracing holes. As of November 2012, all galvanized arms include galvanized hardware! For the time being we are offering the galvanized arms with galvanized hardware for what the previously powdercoated arms and galvanized hardware cost. Stainless steel hardware is available as an upgrade. 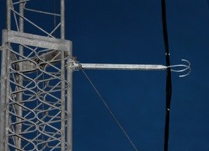 Hoop arms allow all cables to slip through the hoops and self-coil at base of tower. These arms bolt on securely without drilling. Installation does not require taking apart either end of coax cable(s); they simply slip through the split hoop. The top arm is curved and takes the weight of the hanging cables without kinking or damaging them. Click pic to the left for more details, and see gallery for more photos. Curved arms keep coax off the ground and away from the lawnmower! 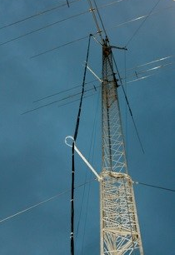 Each arm has a 180°, 6” gentle radius which holds the coax at each tower section. Curved arms require approximately two extra feet of cable length per arm to accommodate the radius. Click pic to left for more details. The arms arrived today in fine shape. I am very impressed with the product/quality work you have done. I am very very happy. Much better than any of the stuff that the OEM company makes. Thank you very much for the fine craftsmanship. 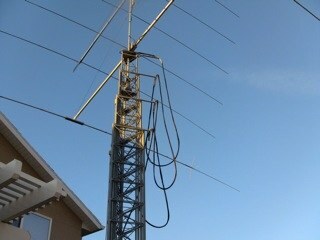 Chris custom built some coax arms for my Force 12 LPT1242 low profile tower. I've had them up for several years and they have been great! Before I got the arms I had damage when the cables snagged when cranking up the tower. No problems whatsoever since I got them!